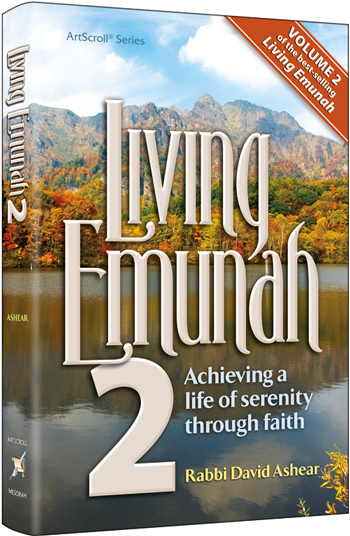 Living Emunah transformed the lives of tens of thousands of people, taking them on a breathtaking journey towards tranquility and happiness – through faith. It’s a priceless gift, emunah. It gives us the tools to endure tragedy and disappointment. It helps us to surmount the insurmountable, to create goals and achieve them. And, yes, it enables us to experience true happiness, the joy that comes from realizing that Hashem knows what is happening in our lives – and will only do what is best for us. With more than thirty-five thousand copies in printLiving Emunah’s, short, accessible and wise daily readings have become a vital part of people’s lives. In Living Emunah 2 we discover still more ways to make emunah a part of our daily life. We see how emunah can change our response to something as small as a traffic jam on a busy day, or as great as a major life challenge. We all sometimes have questions. Why weren’t my heartfelt prayers answered? If Hashem loves us, why is there so much suffering? If I have emunah, can I still cry in pain? In stories, parables and, of course, in the words of our sages and Torah leaders, Living Emunah 2 helps us find the answers.